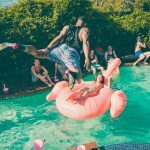 What Are The Best Summer Poolside Activities? 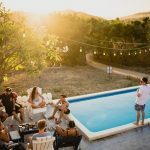 Home / Backyard Living / What Are The Best Summer Poolside Activities? School’s out and summer’s here! The beach is warm and inviting, but lounging for hours in your pool under the scorching summer heat is heaven on earth. With the entire summer ahead of you, now’s the time to plan some great backyard activities while cooling off in the heat with family and friends. Here are 5 of the best summer poolside activities that anyone can enjoy! Who can argue with the reliability of a poolside BBQ? Invite family and friends over, throw some burgers and dogs on the grill, and make sure the pool is ready for anyone looking to take a dip. Fun yard side games like corn hole or badminton are certainly a plus. Make sure to keep good summer tunes playing to maintain that upbeat vibe. You can’t go wrong with snacks like pretzels, chips, celery, and ice-cold drinks. Whether your guests are looking to swim, eat and drink, play games, or just relax, a summer BBQ has something for everyone. Classic! Perfect for kids but enjoyable for adults as well, Red Light Green Light in the shallow end of your pool requires no equipment, just a healthy competitive appetite. In case you need a refresher, one person acts as the “stoplight”, and everyone else lines up on the opposite side of the pool as the cards. The stoplight individual allows the competing players to move towards him or her by calling out “green light”. While their back is facing the players, “red light” is called, which freezes everyone in place. Whoever reaches the stoplight first wins and gets the honor of being the new stoplight. Of course, the stoplight is desperate to catch any moving players in order to eliminate the competition. If the stoplight is successful, they retain control and a new game begins. On land or in the water, it brings outs the best in everyone. Ah, pool volleyball. For the vertically challenged, getting elevation is no longer critical. At a minimum you need 2 players, one on each side, but it’s better when you have 6 to 10 players, depending upon the size of your pool’s shallow end. For the ultra-competitor, the rules are the winner takes all. But for the more casual gamers, just hitting the ball twenty to thirty times in a row without letting it touch the water becomes the true focus. Be wary, some of your pool guests may be overly intense so make sure to bring your A-game! If a volleyball hurling at your body or head is not your cup of tea, you might want to try your hand at water basketball instead. You and your friends will make a splash as you take your skills from the court into the pool. No room for boredom here as this game promises to keep everyone’s adrenaline pumping. With your movement hampered by the water, teamwork is key, so you have to try your utmost to stay balanced. Dive in movies are becoming increasingly more common and for good reason. If you have the space, set up your projector in a convenient poolside location so you and your guests can lounge in or around the pool with some extra entertainment. You can even add a theme by selecting movies from a certain time period or genre such as the 60s, comedy, or drama. Make sure that everyone’s view is unobstructed and that the movie can be heard clearly whether in or out of the pool. Talk about fun! We’ve only scratched the surface on the things you can do with a pool. Be creative! But remember, pool safety is a must, regardless of the games or activities you play. Need more ideas? Subscribe to our blog to get the latest updates on swimming pool trends!